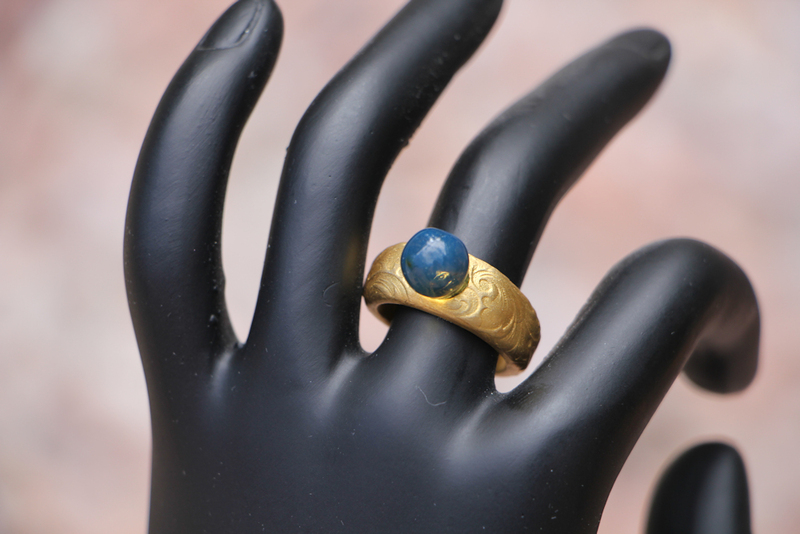 Blue amber is rare, unusual and normally very expensive. Amber is not blue exactly if one looks directly at it. The blue is best seen with incident light coming from behind the observer. All of this amber has a beautiful blue sheen when the light is right. Notice from the sample pictures, that the entire piece is not completely polished. 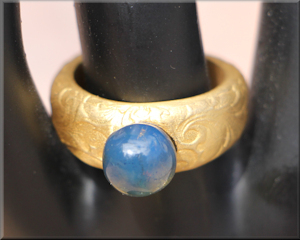 This is because the blue comes through much better if a portion of the amber is left unpolished. 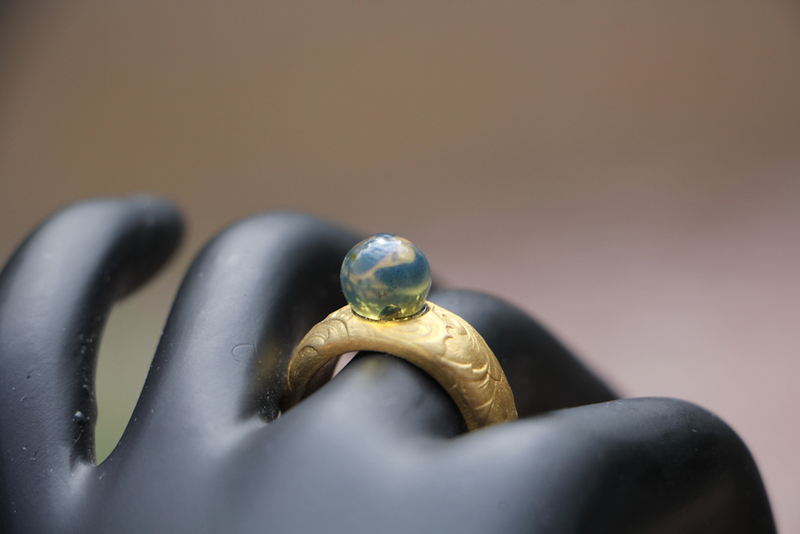 You will not commonly find blue amber on the market, it is not very common. For further information on why blue and green amber are those respective colors, go the blue amber page. This is a rare opportunity to acquire unique amber. The highest quality of blue is currently selling for 10 times the price of gold. IMPORTANT NOTE: This page does include a lot of colors (other than blue), they tend to range from blue to green to red to yellow. Sometimes these colors do not show themselves well unless the angle from the sun is just right. We have tried to take a number of images of each piece so that you can see the amber at different angles with the sunlight. I am not going to try and tell you what color they are, I will let you decide from the accompanying images. All of the amber below is of very good quality. A very nice, solid piece of Dominican amber. This is what I would call a 'clean' piece. It's weight is 21.4 grams. Rather large chunk of amber. 78.2 grams of Dominican beauty. 2.5 x 2 x .5 inches, 31.2 grams. 64 grams with an irregular shape 4 inches widest (3 inches shortest) x .3 inches. Good blue, this will polish into a beautiful piece. This is different. 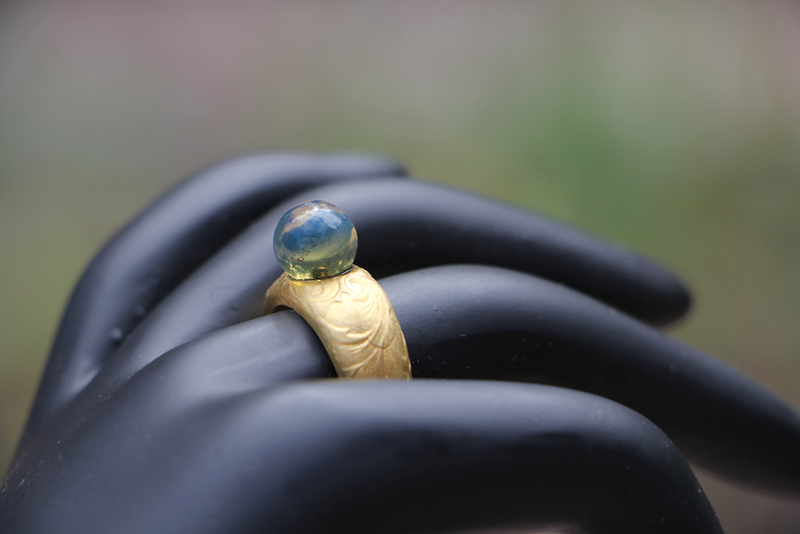 We came into some of these blue amber rings and were so impressed that we now have a few to sell. Inside a room, the sphere looks like normal amber, outside or near a window, the sphere jumps 'beautiful blue' at you. Almost like Dr. Jekyll and Mr. Hyde. Not the slightest idea about sizes, but the inside diameter is 21 mm or 7/8 of an inch. We have never seen anything like this before. We have placed a very good price on the ring. The ring is hollow gold plated, 925 silver. It is very light and easy to wear. The rings are copyrighted by Art 7, a great jewelry design and manufacturer located in Poland. This is almost fully polished and has blue color to it. It has an irregular shape, but is one of those pieces that turn out beautiful. This weighs 34.7 grams and is about 2 x 1.5 x 1.5 inches. 17.7 grams about 2 x 1.5 x .5 inches, irregular shape. 2.5 grams - 1 x .5 x .3 inches. 10.3 grams, about 1.5 x 1 x .5 inches. 27.1 grams, about 2 x 1 x .6 inches. 32.2 grams, about 2 x 1.5 x 1 inches. 73.6 grams - 3 x 1.5 x 1.5 inches. 10.2 grams, about 1.5 x 1 x .4 inches. 8.5 grams, about 1.5 x .25 x .5 inches .